Heavy rains creating havoc, many homeless. 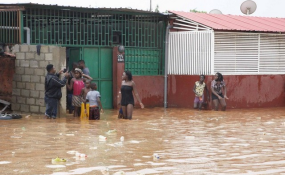 Luanda — The heavy rains battering across the country have caused huge damages and inundated many houses due to the poor drainage systems of the cities, said on Wednesday, in Luanda, the commander of the National Civil Protection and Fire Service, Bênção Abílio. The commissioner - who was speaking to the press during the opening ceremony of the 2018 school term in Viana Municipality National Civil Protection and Firemen School - added that they regret the deaths that have occurred due to the rains and assured that the Fire Service has been able to satisfactorily aid the countless number of citizens who find themselves in such risky and vulnerable situations. However, he underscored that the most concerning situation is recorded in the central region of the country, where the rains have strongly pelted those provinces, so he advised people not be in open areas such as swimming pools when the rain is falling. According to the report, at least eight people have been killed by the last rains that befell Luanda and inundated 3,000 houses, causing the collapse of four houses and leaving 300 families homeless.